On Friday 14 October 2016, the seventh edition of this year’s News Impact Summit series will be organised in Prague, Czech Republic (#NISPRG). The summit will be held at the andel's by Vienna House Hotel (Address: Stroupežnického 21, 150 00 Praha 5, Czech Republic) and will focus on the theme “Digital Journalism Practice: Social Media, Data and Best Way to Tell Stories”. Co-organised by the European Journalism Centre (EJC) and the Google News Lab, in collaboration with Sourcefabric, this one full-day free public event will cover various aspects of innovation in journalism, from cross-platform strategies and visual data-driven storytelling to social media engagement and impact measurement through data analytics. Participants will also have an opportunity to attend skills training workshops and hands-on sessions focusing on methods and tools for journalism, verification, data journalism and live-blogging. The event will be in English with simultaneous interpretation in Czech. 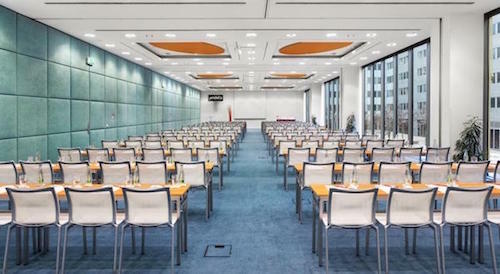 Our event will take place in the conference room at andel's by Vienna House Hotel. There is no way around the fact that journalists and newsrooms need to use different types of message apps and social networks to connect with the audience. From the newsroom point of view, there needs to be a smart way to publish contents to multiple platforms. What can we learn from the leading international media houses? How are they dealing with social and cross platform strategies in order to get closer to the audience? Crowdfunding in journalism is nothing new; but making it as a new way forward for media development in developing world and countries in transition is something Transitions LLC (TOL) is aiming for with its project, Press Start. The session will showcase how TOL is approaching crowdfunding in the context of media development with the Google’s Digital News Initiative Innovation Fund (DNI). Project Syndicate has become the most successful international NPO that connects major media houses throughout the world by providing quality op-ed and expert analysis. How are they going about with measuring the audience reach and engagement? What does data tell about the importance of expert op-eds and what types of op-eds reached a wider audience? Expert Session - Data Driven Journalism: How Journalists Can Get Started With No (or Small) Budget And Resources? Data driven journalism (DDJ) has been around for quite some years in the journalism industry. While there are so many stories, investigation and research that can be done with data, it is often considered as an expensive expert practice by journalists. How can a beginner journalist get started with DDJ? This session will prove "wrong" all the journalists who have believed that this is something only major international media can do. What are the new Google tools journalists can use when working and publishing stories? How are the other media houses using these tools? This session will highlight some of the useful tools such as Google Trends and Google Geo tools that one can use instantly to enhance storytelling and online journalistic research. Covering developing stories in real-time not only requires online editorial skills, but also a simple and smart content publishing tool. Live Blog, developed by Sourcefabric, has now been used by a number of European media houses, and the summit will showcase how the live coverage can be done by using Live Blog. This session will also cover how to get started with Live Blog. Do you want to know how to make your video production easier and faster? Wochit is one of the most used social-friendly video production tools that journalists can use to make an engaging professional short video almost instantly. The session will showcase some of the best examples from the media industry and also covers why video on social networks is something you cannot ignore. Czech Radio’s sensor journalism is one of the most vibrant new formats of digital journalism practices we are witnessing in the world today. The team created a device that is capable of measuring the vibrations caused on the driveways and tested the road quality by driving 400km from Prague to Brno and back. Another story on marathon run monitored oxygen in muscles and blood flow through thigh sensor, chest belt with pedometer and heart rate sensor. This session will give you some backstories on these innovative projects. How is BBC using data as part of various types of story formats? What are BBC’s strategies when it comes to online visuals and how they are being presented for better visually-engaging storytelling? What are the recent examples of social media-friendly graphics and interactives? Amanda Farnsworth, Head of Visual Journalism of BBC News will share the insights. Claims, photos and videos shared by the eyewitnesses of an incident play a vital role in telling breaking news stories. What are the examples where user-generated contents broke news first? How did they provide different untold perspectives to the story? What are the basics and principles to follow when you see claims and audio-visual contents on social networks? The Verification Track covers the basic principles of verification and case studies to get you started. How do you turn a news organization with Radio in its name and 28 different markets into a respected visual player? Over the past 18 months Radio Free Europe has done just that by adopting an aggressive distributed content strategy and pooling resources into small teams to create award-winning digital and video content. We'll talk about the process: fieldwork, using tools like drones and 360 cameras; designing the digital story; and the social and explainer videos that were the first of their kind in the eastern European market. Getting a permission to use the photos and videos that are shared on social networks is one of the core steps that today's news journalists should practice as part of the verification process. However, there are many risks when reaching out to the sources in the digital environment which potentially put journalists legally at risk. This session features some of the "fails" and worst practice of permitting with the eyewitnesses and content uploaders, and provides practical tips and examples of how you can prevent being an unethical journalist. Panama Papers, the recent global investigations conducted by hundreds of journalists, were the most successful digital collaboration project in journalism history. It made a huge buzz also in Czech Republic which resulted the country’s PM to call for probe into activities of Czechs on Panama Papers files. How did the Czech journalists dive into the investigation? This session will provide insights and background on how the investigation was conducted by the Czech journalists.